Progress and improve your team's tackling further, with the second part of our confidence in contact session! 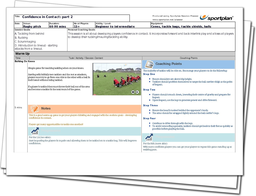 Continue forward to work on different plays of the game, including scrummaging, rucking and introducing the line out to your players; all of these require contact so it's important that your players are ready for the task in hand! Recap from last week and start with a simple game of Bulldog (but with a twist! ), before moving onto a simple shoulder front tackle exercise. Once your players are confident with tackling, we look at rucking, as well as the art of tackling behind and continuing onto the scrum. It's important that your players are fully focused and able to perform the correct technique; the incorrect technique could result in giving away a penalty or cause an injury! Continue to develop your player's confidence and watch them perform in matches! Take a look at the first session in the Confidence in Contact series, to help you to start improving your player's confidence.